For example, if three students in Mr. Ahab’s English class of 40 students received from 90% to 100%, then, <!–<newline count=”1″/>–>f = 3, n = 40, and RF = = = 0.075. 7.5% of the students received 90–100%. 90–100% are quantitative measures. Go to [link]. There are calculator instructions for entering data and for creating a customized histogram. Create the histogram for [link]. 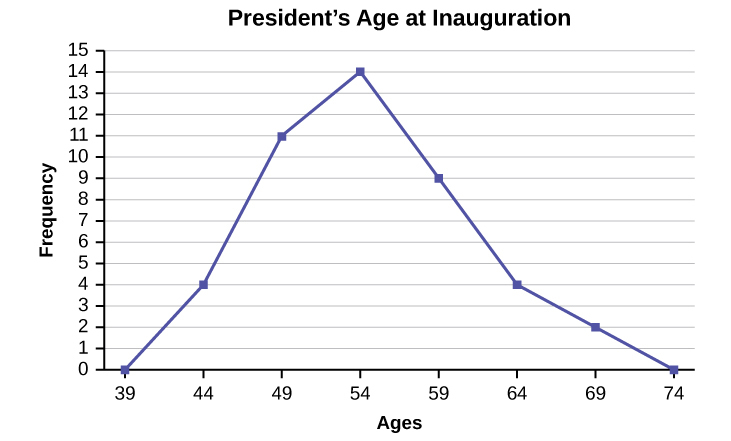 Construct a frequency polygon of U.S. Presidents’ ages at inauguration shown in [link]. 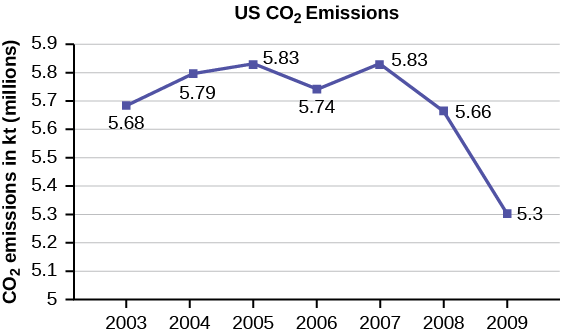 The first label on the x-axis is 39. This represents an interval extending from 36.5 to 41.5. Since there are no ages less than 41.5, this interval is used only to allow the graph to touch the x-axis. The point labeled 44 represents the next interval, or the first “real” interval from the table, and contains four scores. This reasoning is followed for each of the remaining intervals with the point 74 representing the interval from 71.5 to 76.5. Again, this interval contains no data and is only used so that the graph will touch the x-axis. Looking at the graph, we say that this distribution is skewed because one side of the graph does not mirror the other side. 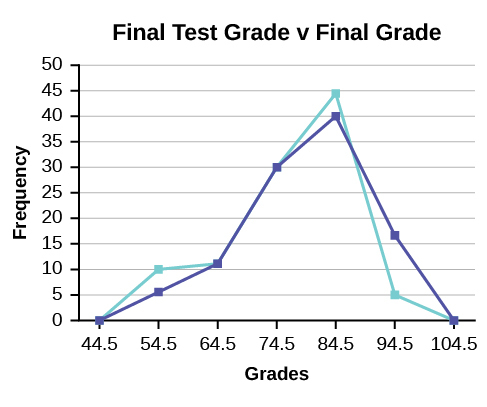 We will construct an overlay frequency polygon comparing the scores from [link] with the students’ final numeric grade. Sixty-five randomly selected car salespersons were asked the number of cars they generally sell in one week. 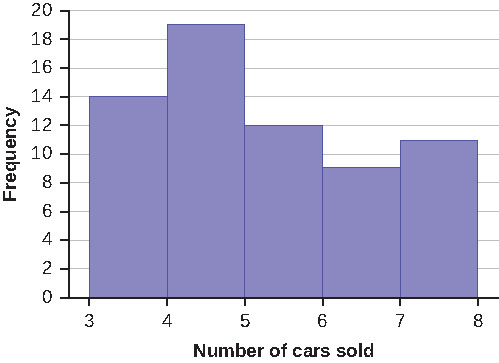 Fourteen people answered that they generally sell three cars; nineteen generally sell four cars; twelve generally sell five cars; nine generally sell six cars; eleven generally sell seven cars. Complete the table. What does the frequency column in [link] sum to? Why? What does the relative frequency column in [link] sum to? Why? What is the difference between relative frequency and frequency for each data value in [link]? The relative frequency shows the proportion of data points that have each value. The frequency tells the number of data points that have each value. To construct the histogram for the data in [link], determine appropriate minimum and maximum x and y values and the scaling. Sketch the histogram. Label the horizontal and vertical axes with words. Include numerical scaling. Construct a frequency polygon from the frequency distribution for the 50 highest ranked countries for depth of hunger. Find the midpoint for each class. These will be graphed on the x-axis. The frequency values will be graphed on the y-axis values. The following data sets list full time police per 100,000 citizens along with homicides per 100,000 citizens for the city of Detroit, Michigan during the period from 1961 to 1973. Often, cruise ships conduct all on-board transactions, with the exception of gambling, on a cashless basis. At the end of the cruise, guests pay one bill that covers all onboard transactions. 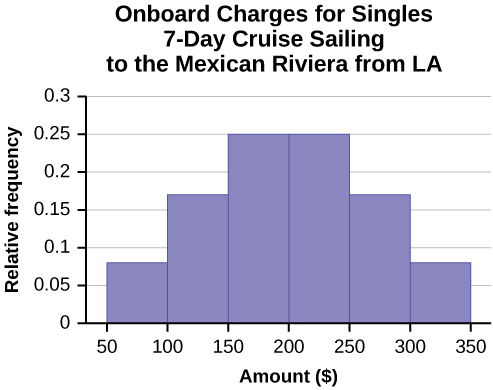 Suppose that 60 single travelers and 70 couples were surveyed as to their on-board bills for a seven-day cruise from Los Angeles to the Mexican Riviera. Following is a summary of the bills for each group. Construct a histogram for the singles group. Scale the x-axis by 50 widths. 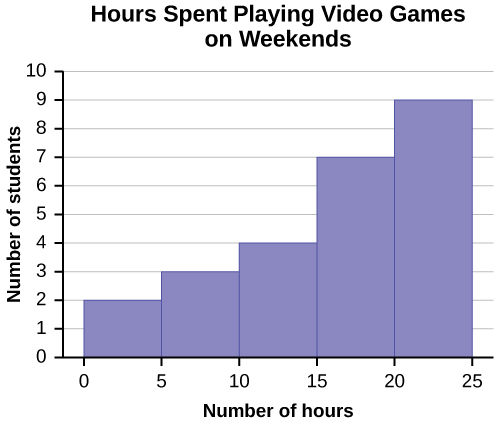 Use relative frequency on the y-axis. Construct a histogram for the couples group. Scale the x-axis by 50 widths. Use relative frequency on the y-axis. Construct a new graph for the couples by hand. Since each couple is paying for two individuals, instead of scaling the x-axis by 50, scale it by 100. Use relative frequency on the y-axis. In the following histogram data values that fall on the right boundary are counted in the class interval, while values that fall on the left boundary are not counted (with the exception of the first interval where both boundary values are included). 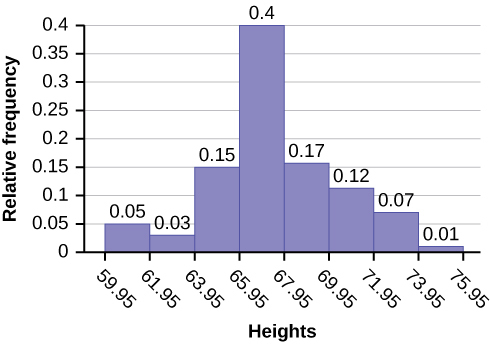 In the following histogram, the data values that fall on the right boundary are counted in the class interval, while values that fall on the left boundary are not counted (with the exception of the first interval where values on both boundaries are included). Both graphs have a single peak. Both graphs use class intervals with width equal to 50. The couples graph has a class interval with no values. It takes almost twice as many class intervals to display the data for couples. Answers may vary. Possible answers include: The graphs are more similar than different because the overall patterns for the graphs are the same. 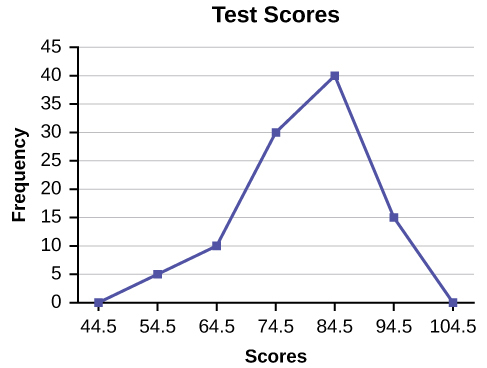 Both graphs display 6 class intervals. Both graphs show the same general pattern. Answers may vary. Possible answers include: Although the width of the class intervals for couples is double that of the class intervals for singles, the graphs are more similar than they are different. Answers may vary. Possible answers include: You are able to compare the graphs interval by interval. It is easier to compare the overall patterns with the new scale on the Couples graph. Because a couple represents two individuals, the new scale leads to a more accurate comparison. Answers may vary. Possible answers include: Based on the histograms, it seems that spending does not vary much from singles to individuals who are part of a couple. The overall patterns are the same. The range of spending for couples is approximately double the range for individuals. Twenty-five randomly selected students were asked the number of movies they watched the previous week. The results are as follows. 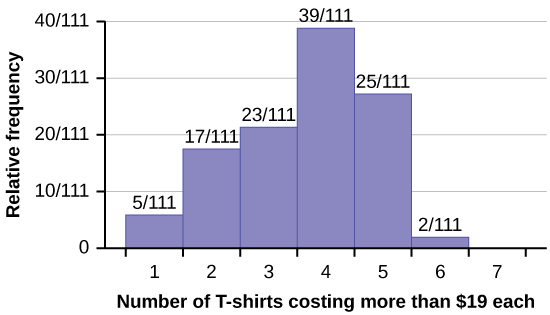 Use the following information to answer the next two exercises: Suppose one hundred eleven people who shopped in a special t-shirt store were asked the number of t-shirts they own costing more than 19 each. Construct a bar graph of obesity rates of your state and the four states closest to your state. 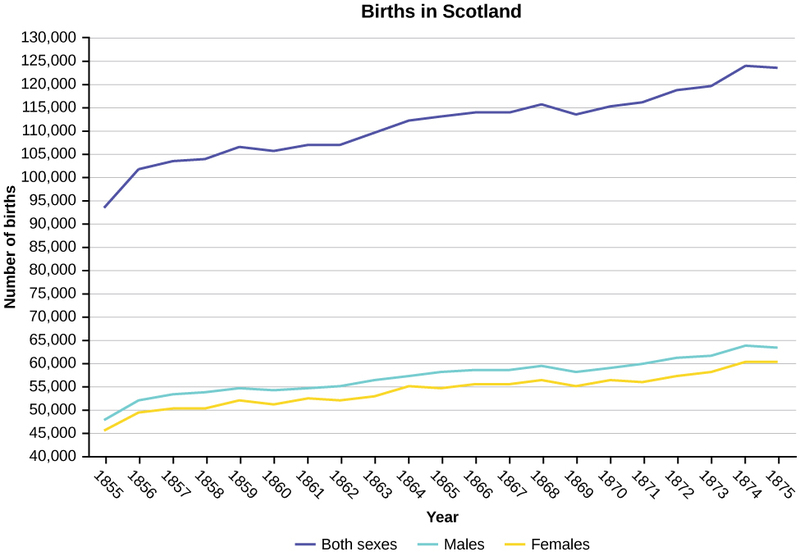 Hint: Label the x-axis with the states. 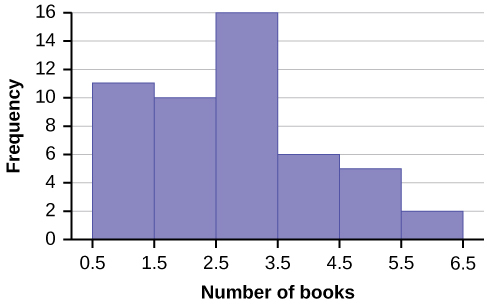 a graphical representation in x–y form of the distribution of data in a data set; x represents the data and y represents the frequency, or relative frequency. The graph consists of contiguous rectangles. Histograms, Frequency Polygons, and Time Series Graphs by OpenStaxCollege is licensed under a Creative Commons Attribution 4.0 International License, except where otherwise noted.